Everything you need to know about this weekend’s UFC 196 fight between Conor McGregor and Nate Diaz. Conor McGregor is a history maker. Conor McGregor is a money maker. He was aiming to be both of those things on Saturday night. Now he’ll have to settle for just one. From the moment McGregor became the UFC featherweight champion last December with a stunning knockout of José Aldo, the 27-year-old Irishman was setting his sights higher. Bigger money fights. Bigger opponents. And so a superfight was scheduled between the new 145-pound king and lightweight champion Rafael Dos Anjos. McGregor would be attempting to become the first fighter in UFC history to simultaneously hold championship belts in two weight classes. The bubble of expectation burst last week when Dos Anjos pulled out of the fight after breaking a foot in training camp. History would have to be put on hold. But there still was money to be made, so McGregor set his sights on the most fan-friendly fight available to him. That’s where Nate Diaz came in. He’s pugnacious and enigmatic, tough and rangy, as in-your-face as they come. And so a collision course was set. When McGregor (19-2) steps into the octagon for the main event of UFC 196 at the MGM Grand Garden Arena in Las Vegas on Saturday night, he will carry the sport on his broad shoulders. A winner in all seven of his fights since joining the UFC three years ago, the Dubliner has steadily risen in the sport, currently standing at No. 4 in the SI.com pound-for-pound rankings. Beyond that, McGregor’s reputation has evolved from “he talks a good game” to, as UFC president Dana White has said, “he’ll take on anyone, anytime, at any weight.” This bout will be at welterweight, so that Diaz won’t have to cut to the lightweight limit on short notice. Think about that. The 145-pound champ is fighting at 170. Diaz (18-10) is even more mysterious than that. He ranks No. 10 in the SI.com lightweight tally, but sometimes he looks much better, sometimes far worse. When Diaz is on, as he was in December against Michael Johnson, he’s as formidable as they come. When he’s off, as he was in the bout before that—a year earlier, when he missed weight and gave Rafael Dos Anjos little trouble—the 30-year-old from Stockton, Calif., can seem lost in the cage. Who will show up on Saturday? In addition to the pay-per-view telecast of Saturday night’s five-fight main card—which also includes a women’s bantamweight title bout between Holly Holm and Miesha Tate—four prelims will be shown on Fox Sports 1, starting at 8 p.m. ET, and the event’s first three bouts will be available on the UFC Fight Pass online service at 6:30. No sooner had Nate Diaz resuscitated his career with a dominant victory in December than he stepped to the microphone to deliver a message. Not to his fellow lightweights, but to a fighter who a week earlier had become the champ in a different weight class. That’s how this meeting of the UFC featherweight champion and a man who’s been a lightweight for most of his career ended up as a welterweight bout. Dublin, Ireland BIRTHPLACE Stockton, Calif.
Dublin, Ireland RESIDENCE Stockton, Calif.
*Official weights announced at the weigh-in (Friday, 7 p.m. ET, Fox Sports 2). 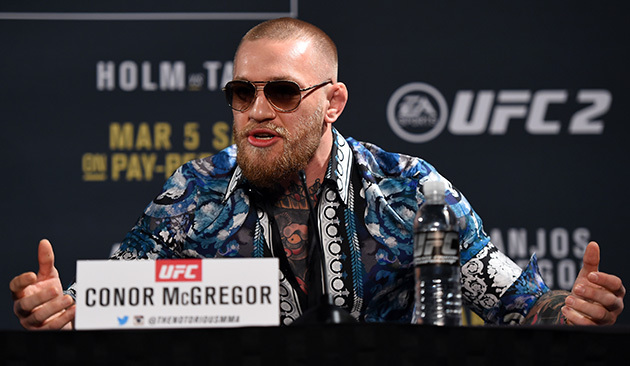 15: Consecutive victories by Conor McGregor, a streak dating back five years. In all but one of the wins, he has finished his opponent (13 KOs, 1 submission). 5: Consecutive bouts for which McGregor has been awarded Performance of the Night bonuses. Nate Diaz is a bonus machine, too, with a dozen over his career (six Fight of the Night, five Submission of the Night, one Knockout of the Night). 13: Seconds it took for McGregor to knock out José Aldo and win the featherweight belt, the fastest finish in UFC title fight history. 8: Submission wins by Diaz, tied for the second-most in UFC history. Nate Diaz is the first fighter Conor McGregor has faced in the UFC with the length and forward-moving standup to perhaps knock the Irishman off his rhythm. And he’s also the most dangerous grappler McGregor has seen, with a jiu-jitsu game capable of finishing the fight in an instant. Diaz, on the other hand, has never before fought someone with a bravado more puffed out than his own. It’s not simply a matchup of bluster, though. On the mental side, McGregor has a self-belief unmatched in the sport. And physically he’s far more fluid than not just this opponent but also any other he’s been in with. Each man faces obstacles beyond the other, as well. McGregor is competing in a weight class 25 pounds heavier than his comfort zone. And Diaz is being asked to perform on short notice, without a full training camp. All of those challenges play off each other. Diaz isn’t a natural welterweight, just a lightweight who is not being asked to cut to 155 pounds. He’s the bigger man, but not necessarily the brawnier. We’ve seen him overwhelmed in the cage. We’ve yet to see anything of the sort from McGregor. McGregor is the favorite, with a money line ranging from -375 (bet $375 to win $100) to -450 (bet $450 to win $100) at various sportsbooks. The line on Diaz ranges from +280 (bet $100 to win $280) to +375 (bet $100 to win $375). Holly Holm vs. Miesha Tate, women’s bantamweight championship; Gian Villante vs. Ilir Latifi, light heavyweight; Corey Anderson vs. Tom Lawlor, light heavyweight; Amanda Nunes vs. Valentina Shevchenko, women’s bantamweight.